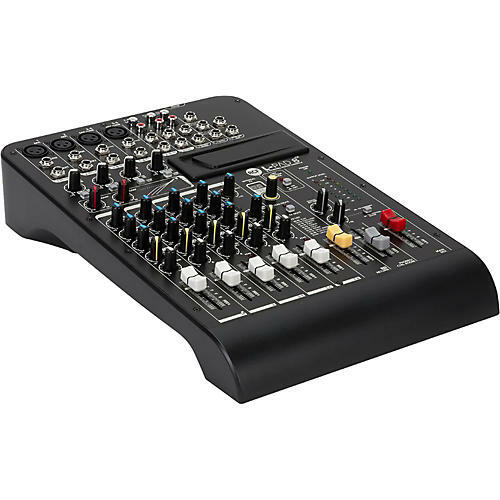 This small to medium format mixer from RCF satisfies all of the requirements for duo and trio rehearsal and performance, and suffices as a hub for simple home recording environments as well. The RCF LPAD-8CX is useful to business presenters as a front end for a sound reinforcement system and for venues that use music playback and small group live entertainment. It has four XLR mic inputs with transparent mic preamps and three stereo line inputs, each with ¼ in. pairs. A 2-track in/out scheme with RCA stereo jacks completes the input picture and makes it ideal for duos or trios, conferences with multiple speakers, corporate events and anytime you need to mix up to four microphones along with other line-level signals. An Internal FX DSP with 99 presets adds warmth and liveliness to the input signals. It has two auxiliary sends as well (one for the FX, but you can use it as a second monitor send if you prefer). The L-PAD slot allows you to add the optional L-PAD MP3 PLAYER, PLAYER/RECORDER or BLUETOOTH CONNECTION cards, very useful for bands running recorded material between sets, karaoke shows, or business presenters with recorded material.